North American Breweries, brewers of Magic Hat and a range of brands and breweries, rebranded at the beginning of 2019, taking on a closer identity with international parent company FIFCO. They wanted the new design to reflect the dynamic color palettes of their brands. 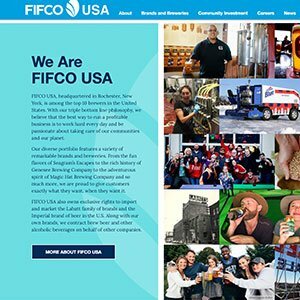 Partisan worked closely with FIFCO’s Jim Brayton and Mary Beth Popp to create a new look and a custom WordPress theme to relaunch as FIFCO USA.